Without creativity, businesses risk their products becoming undifferentiated commodities. So how do businesses encourage and nurture creativity? The UK is a world leader when it comes to the creative industries. But globalisation has created an environment in which the success of the UK depends on its ability to inspire the next generation of talent to be more creative in order for businesses in the sector to maintain their competitive advantage. Creativity is about conceiving new ways for the world to be and turning those ideas into reality. It can come about by finding new patterns in existing practice, making connections between previously unrelated concepts or coming up with solutions to problems. In a business context, creativity is behind the creation of new and useful products or better ways of doing things. To be creative in business it is essential to be willing to take risks and endure through difficulties and opposition to succeed in the creative project. Being creative inevitably involves risk. These risks include social risk. At individual level this includes the danger of being laughed at by peers, having your efforts dismissed or being disadvantaged in a career sense for being too imaginative, too much of a risk taker, or threatening the status quo. But companies only thrive if they can innovate. In a business context, creativity is essential to innovation: the implementation of new and improved products, services and processes. Without creativity, businesses risk their products becoming undifferentiated commodities. But companies struggle to enable creativity, often because they find safety in established ways of doing things. Finding ways to balance risk with gain is a large part of establishing creative practice in an organisation. A 2012 study by Adobe found that the majority of people felt they were not fulfilling their creative potential. 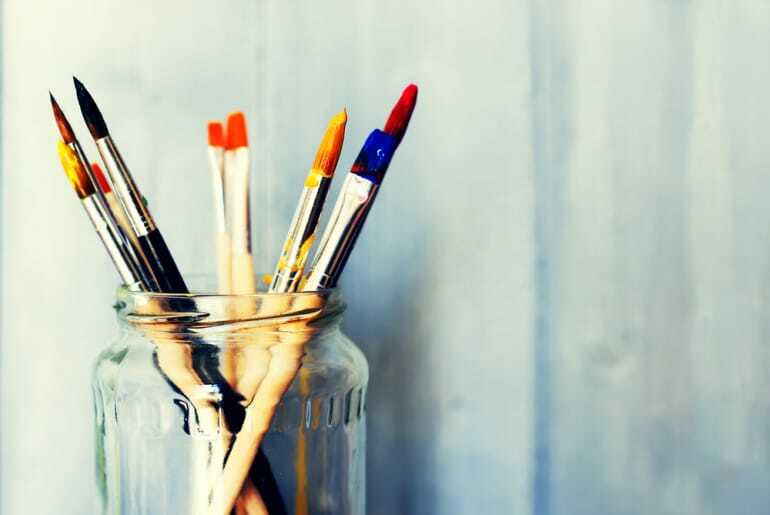 However, the same study found that the majority of people also agreed that creativity was essential to the economy, as well as generally valuable to society. 75% of those responding to Adobe’s survey said that they felt under pressure to be productive rather than creative at work. Taking time out of regular tasks to try to be creative can be seen as time wasted. Although many people seem to believe that the world is divided into creative and non-creative people, creativity is not a skill that is unique to particular people. All humans have the potential to be creative, however they require opportunities and encouragement to express this creativity. Creativity in the workplace can be encouraged. The main thing is to develop an environment where creativity is acceptable and not suppressed. Mockery should be discouraged and all team members should be allowed to have a voice and express their thoughts in a mutually respective environment. Giving employees a platform for their ideas, such as a brainstorming session, can be a way to seek out ideas and have their relative merits discussed by the team. For some personalities, having to voice and defend ideas is an excruciating experience. Shyer personalities may have great ideas but they may prefer to express them in a less public way such as in a one-to-one meeting or via a suggestion box. It’s also important that people see at least some of their ideas implemented. People who generate proposals that they know are good ones will be discouraged if they do not see them considered seriously or implemented. Next time they have a good idea, they won’t bother sharing it as they don’t expect it to be taken seriously. One example is a manager asked to reorganise a call centre in order to better cover peak times. The manager consulted with the best call handlers and found they were willing to radically change the shifts they worked in order to cover peak times more efficiently. The new system was implemented and calls were answered significantly faster. However, the manager was told that the new working arrangements conflicted with the company’s established working practices and they had to return to the previous shift patterns. The manager was also told to find a solution to covering peak time better. Inevitably, she quit in frustration that her proven solution could not be accepted as the company could not accept that there was a better way of organising its working patterns. Creativity is a risk, and risk needs to be rewarded. The satisfaction of making a positive change can be its own reward; seeing your changes implemented and making a difference can be extremely satisfying. Career advancement and financial gain such as profit share can be more concrete rewards for creative thinking. The flip side of creativity is failure. New ideas don’t always work and innovation only occurs by first eliminating the changes that don’t work. A creative workplace needs to be prepared for failure and to balance the size of potential risk with the possibility of reward. Individual employees cannot be the ones to bear the risk if their idea fails. If employees learn that being creative at work can damage their prospects, creativity in the workplace will be suppressed. A creative workplace needs to have an environment in which failure is permissible and not catastrophic, whilst at the same time ensuring the team is motivated to succeed. It’s been established that creativity is a product of environment, so removing boundaries and restrictions on where people work may be helpful. Many companies find team away days are a good way to move out of the normal environment and try to find new ways of interacting in order to spark ideas by a change in environment and interaction. Established ways of thinking are disrupted when routines are removed. Creativity can come from unexpected corners of the workplace, so the environment of the entire organisation should be geared towards encouraging creativeness rather than restricting these behaviours to one particular team or discipline within the whole. It’s also helpful if creativity is seen as an ongoing and permanent process rather than one restricted to within the confines of away days and brainstorming meetings. Other tips include promoting a healthy work-life balance and ensuring employees are able to get enough sleep and rest to function at their best. There also seems to be correlation between positive mood and creativity. A fun work environment where it is acceptable to be playful can support creative thinking. There are two sides to creativity. Not only does it involve thinking of a new way the world may be, make connections between previously unrelated items or ideas, or find solutions, but it also entails acting on these ideas to produce something. Unrealised creative dreams are mere imagination. It’s also essential that something results from the creative thought process and that something is produced of it. Without this, it is merely dreaming. Is Fashion Slang Here to Stay?